This year’s conference theme; ‘the importance of plants’ perfectly encapsulated the excitement and energy of the delegates, and their passion for studying the botanical world, whilst also highlighting our fragile dependency upon a mere handful of crop species, and the alarming rates at which biodiversity is being destroyed. In the opening talks on Sunday afternoon, delegates were introduced to the ‘Shenzhen Declaration on Plant Sciences,’ a manifesto challenging international governments to take plant sciences seriously. The declaration gives seven priorities to allow society, with the help of science, to mitigate impacts of human activities on plant species, habitats, and distributions, and to approach the formation of a sustainable world for ourselves and those who follow us. My poster described the current knowledge gaps and shared my aims and proposed methods. This gave me the fantastic opportunity to discuss my project with numerous researchers boasting expertise in a broad range of relevant fields at a point when my plans were still fluid and easily altered. I was pleasantly surprised to be independently sought out by three researchers wishing to discuss my project in more detail having already viewed my poster either on the conference app, or in the poster display area adjacent to the reception. Additionally, the lunchtime poster sessions enabled me to meet many more researchers interested in my future results, and intriguing questions resulted in some interesting discussion and numerous suggestions which I found very valuable. On Wednesday morning, the world’s experts on Begonia met at the Fairy Lake Botanical Garden. 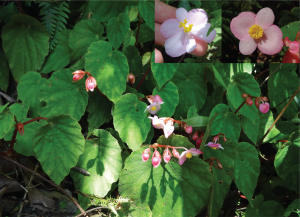 The researchers discussed conservation strategies and the establishment of an international Begonia working-group to facilitate more efficient communication among those interested in Begonia, and future collaboration opportunities. Immediately after IBC, my research group visited a lab in Taiwan to work with Yu-Hsin, the first person to use the custom bait set designed for Begonia which I intend to use in my own project. Going to an international conference at such an early stage of my PhD, I was anxious about not yet having any results to present, however I found the experience extremely beneficial. Presenting a PhD concept poster resulted in interesting and highly useful discussion on both the merits and pitfalls of my proposed approach with scientists I would not otherwise have met. 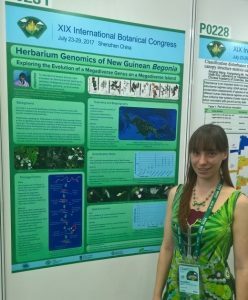 Attending some of the symposiums during the IBC also gave me the opportunity to meet new researchers in my fields, extending my network, developing new and productive relationships, and maintaining existing ones; facilitating greater collaborative opportunities and establishing an exciting new link with a forestry project in Madang province leading to mutually beneficial material sharing. I am very grateful to have received one of the RSB’s travel grants, and encourage any readers to apply for one too! The 2018 Travel Grants are now open for applications, with up to £500 available for those wishing to travel to further their studies.